It is not enough to merely breathe. It is not enough to do the things we ought to do, to accomplish what we have set out to accomplish, to graduate to any measure of success. It is not enough–and never will be–to get through each day. It is not enough to wake up in the morning and go where you’ve been before, do what you’ve already done, and continue what you have already started. This is not life. Or perhaps it is. I cannot know . . . only think. Everything is patterns and rituals and responsibilities. Days slip into days, then into months, and further into years. We are all quite caught up in our dreams. There is no fault in that. Without a dream, what sort of purpose could ever inspire the soul? And dreams, no matter how little or small, do not come true by themselves. They must be sought after. They must be worked for. They must be pursued–and most ardently, if success is ever to be gained. And yet I cannot help but think, as I look around me, that we have missed something vital. Have we, perhaps, become so dedicated to our duties, to our responsibilities, that we have forgotten the little things? Life is moments. Not plans, not schedules, not calendars . . . but tiny, insignificant moments. It is not sitting behind a desk or driving to work. That is standard. That is expected. It is, rather, doing the things you have not done. It is doing something on an impulse . . . it is racing into a thunderstorm and dancing in the rain. It is running through the grass with the wind on your face. It is finding your old paint brushes and sitting down to paint a sunset. Why have we become too busy to grasp the little things? We are dull. We are sensible, predictable human beings who live one day the same as the next, never changing, never doing anything different than anyone around us. And this, my friend, can never be acceptable. We must do the spontaneous. We have no other choice. We must know that we are alive . . . ours senses must be filled. We must feel, to the greatest extent, to the deepest core of our beings. So when you are fulfilling those dreams you work so hard for, do not forget that there is more to life than breathing. 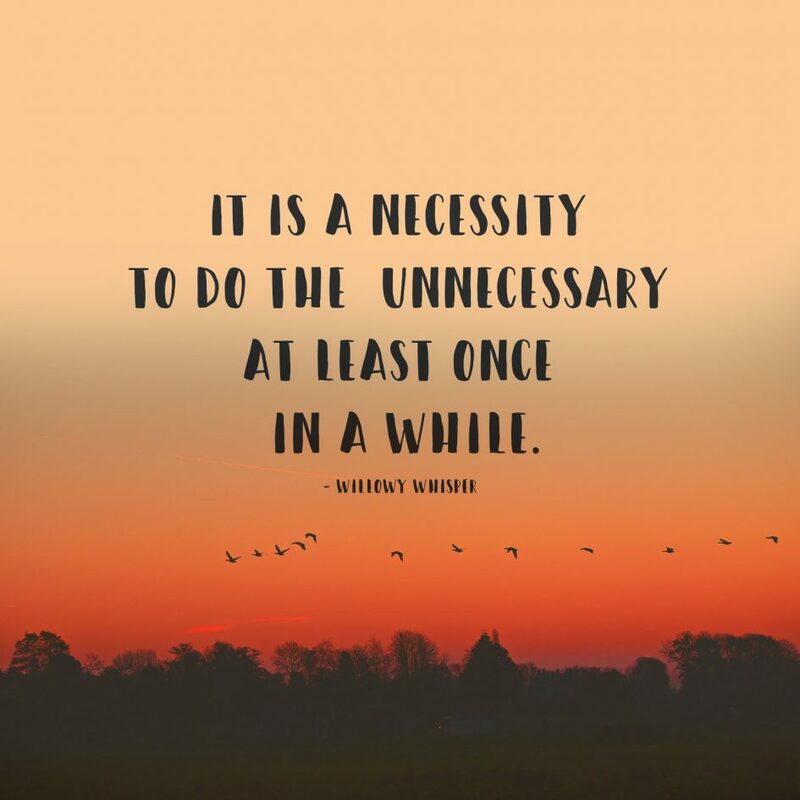 It is a necessity to do the unnecessary at least once in a while, is it not?